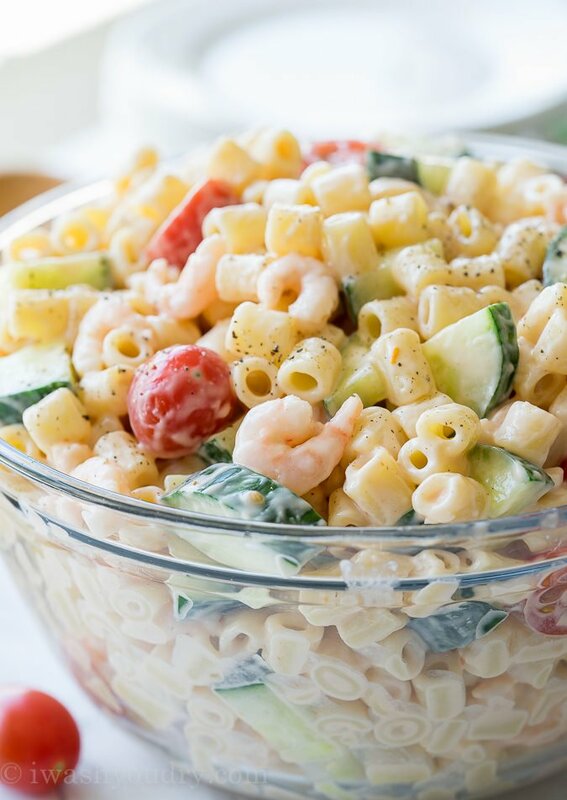 Shrimp Pasta Salad is a super simple, cold pasta dish that’s perfect for potlucks, BBQ’s and parties! 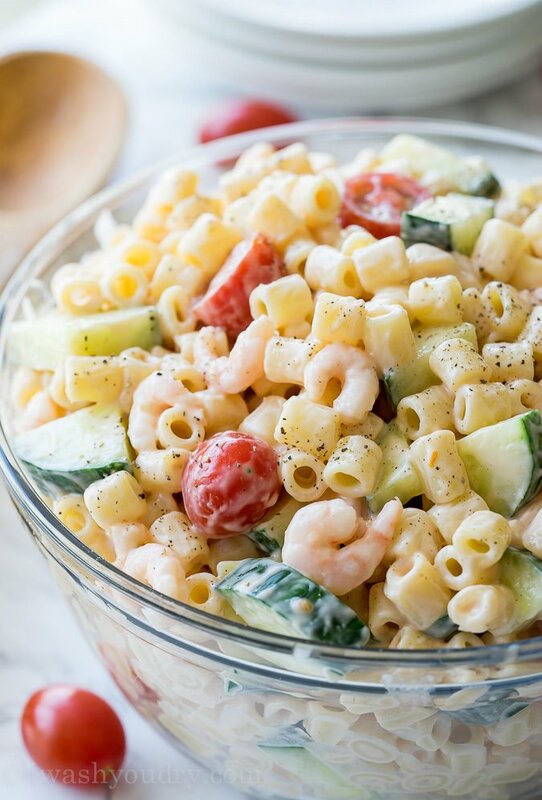 Shrimp Pasta Salad is filled with crisp cucumbers, juicy tomatoes and bite size shrimp, all tossed in a creamy and tangy sauce! This is going to be a special week for me (and you). I’m sharing some family recipe from my sweet Aunt Nancy!! Growing up in Arizona, my Aunt Nancy lived just two blocks away from me. She was always whipping up the most delicious food, and I thoroughly enjoyed stopping by her house to pick up a snack on my way home from school. She worked from home so I was always guaranteed a tasty snack, a cold drink of water, and of course a hug and a kiss every time I visited. She’s the best Aunt ever. 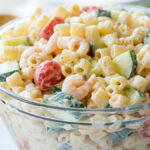 One side dish that was ALWAYS requested during family gatherings was her infamous Shrimp Pasta Salad. I am giddy with excitement, because I have loved this salad ever since my childhood. When I was mixing up the dressing and folding it into the pasta, I was instantly transported back to my Aunt Nancy’s kitchen; watching her mix up this salad, and waiting eagerly to take a bite. Nancy was (and still is) a very proper lady. 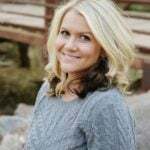 She wouldn’t let us kids go anywhere without teaching us a lesson or two in manners first. I remember one summer when my sister and I stayed with her for a few days and she taught us all sorts of things, like how to properly set a table, and how to have a conversation while eating. There are so many wonderful things I could share about her, but I’ll save it for later this week with the other family recipes, like Monkey Meat and Vinegar Cucumbers and Onions. I will say this though, she is one of my major inspirations for putting on that apron and getting in the kitchen. Let’s talk about this Shrimp Pasta Salad – The dressing is simple. It’s mayo based, but I imagine you could use half mayo, half greek yogurt to reduce some calories. Nancy’s original recipe calls for the addition of ketchup, a little salt, a little sugar and just a touch of milk to thin out the dressing. I wanted to add just a little zip to the dressing, so I added a tablespoon of horseradish, which gave the dressing a creamy cocktail sauce flavor. AMAZING! Also – little shrimp! These shrimp are found by the canned tuna. Just look for the cans of shrimps in “medium” size. Trust me, they are there, and be sure to splurge a little on the better quality, name brand for this. It makes a difference. UPDATE: Over the past few years, I’ve started using the frozen baby shrimp instead of the canned version. It’s a little fresher and the taste is great! Nancy says the pasta is called D pasta, but the package I found was called Ditalini Pasta. Basically “little tubes”, or little pasta shells would work too. 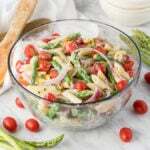 If you’re looking for a pasta salad to share with friends and family that nothing can compare to, then you’ve got to try this one out! You’ll love it! 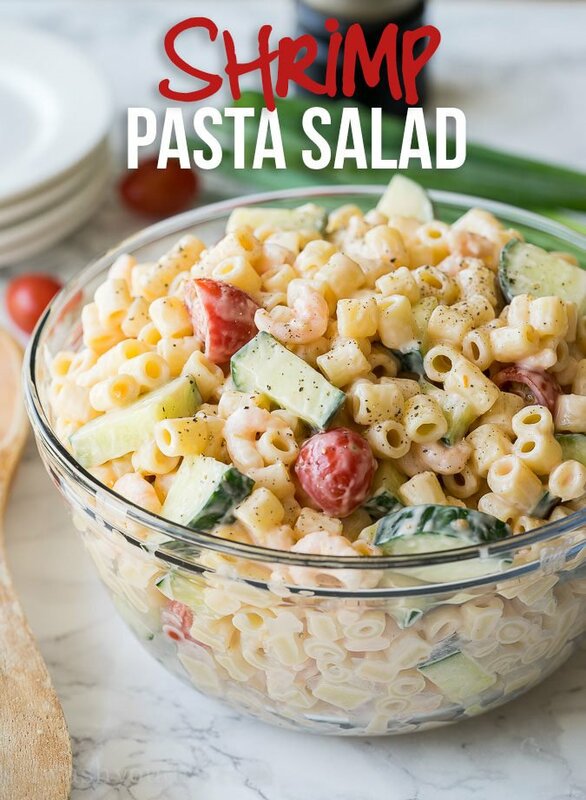 Shrimp Pasta Salad is a super simple pasta dish that’s perfect for potluck, BBQ’s, and parties! Boil the pasta in a large pot of salted water according to package instructions. Drain the pasta and run under cold water, until cool, drain and place in a large bowl. Drain and rinse the shrimps under cool water, add them to the bowl of pasta along with the diced tomato and cucumber. Set aside. In a separate bowl whisk together the ingredients for the dressing, adding more milk if necessary to reach desired consistency. Pour the dressing over the pasta and gently stir together, to coat and mix the pasta salad. Chill until ready to serve. When I diced the tomatoes, I strained them in a fine mesh strainer to remove any excess liquid out of them. I also love to add additional salt and pepper on top before serving! Originally published 8/18/2014. Updated 4/17/2018. 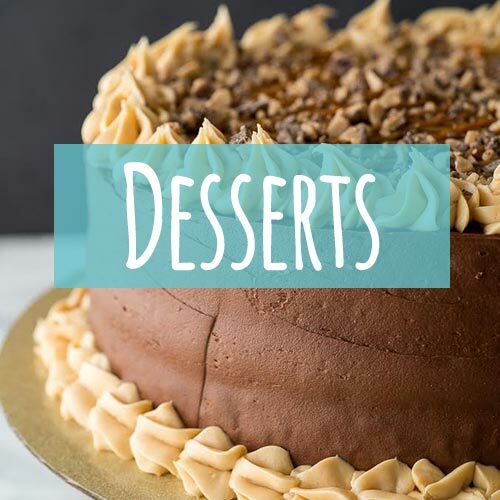 everyone of your recipes can be shared on Pinterst. I shared 2 macaroni salads there . will they be pulled off of Pinterest because I did that? I don’t want to be. that is the only place besides facebook that I can remember them all. I would like to Pin some more only if you give me permission otherwise I will remove the 2 I have. instead of putting this out can you just send the answer in my ebox? I am wondering if you can substitute cherry tomatoes for the chopped tomatoes…looks like they were used in the photo?? could you use cocktail sauce to sub for the ketchup and horseradish? I’m glad I was surfing through your recipes and found this! Years ago while living in Okatie S C, a neighbor brought this salad over for a Pot Luck Lunch and I loved it. Made it many times, but through our moves from SC to Calif to Fl I lost the recipe! This is almost the same, mine called for frozen peas used at the last min. before serving, no ketchup, and fresh shrimp. Can’t wait to try yours with the ketchup. How wrong would it be to make this now? If I had the shrimp, I would…and if I hadn’t changed for bed, I’d be off to but shrimp!! Can frozen shrimp be used? I love to make use of the frozen, cooked, no tail shrimp! 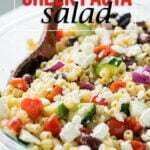 This pasta salad looks great. Ditalini is one of my favorite styles of pasta, so much you can do with it. 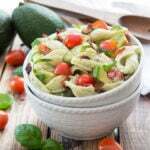 great idea to get some protein in a pasta salad! 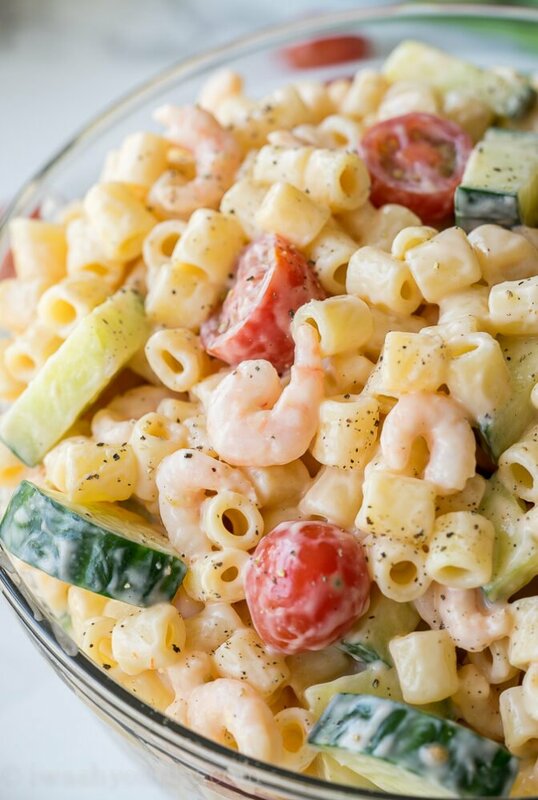 loving the look of this shrimp pasta salad! definitely need to recreate the recipe, looks delicious. Gah! This looks fabulous Shawn and I am the queen of shrimp – I love them so, so, so much and use them in nearly everything. To have a shrimp pasta salad – perfect. Pinned! 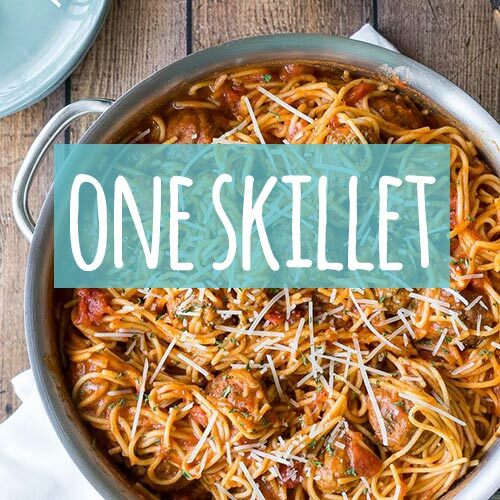 You have me totally craving pasta now!